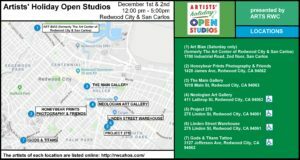 Welcome to the 3rd Annual Artists’ Holiday Open Studios in Redwood City & San Carlos! 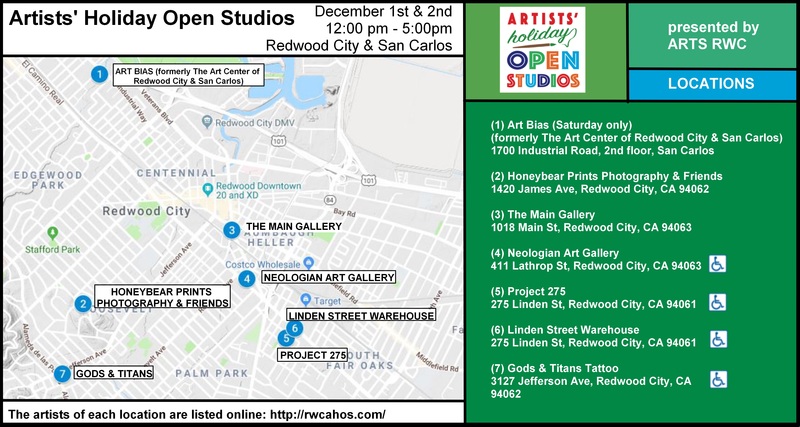 On the first weekend of December, artists throughout Redwood City & San Carlos will open the spaces in which they create and exhibit their work to the public. This is a once-a-year opportunity to meet local artists, learn about their processes and buy original artwork as unique gifts for family, friends and your own art collection! Click on map for a larger version that you can print & bring with you! ARTS RWC is an arts round-table created to advance Redwood City as a destination for the arts. Bringing together individual artists, civic and arts organizations, it strives to promote art in all forms and to inspire a higher quality of life in the Redwood City community.